I read and reviewed this book with a sense of excited expectation. I am from the generation of Napoleonic wargamers who were introduced to the hobby with the Airfix guide written by Bruce Quarrie. While we would never now use these rules for our wargaming—a fact reinforced when we recently pulled them out for a nostalgic game, only to quickly shelve them again—the book remains one of my favourites. I still enjoy flicking through the pages, enjoying Quarrie’s turn of phrase and recalling how it generated a sense of excitement and anticipation in a 14 year old boy at the prospect of painting and building an army, setting up a wargame and getting on with the contest. I thought that Grand Battery could have been akin to a 'Quarrie' for another generation of Napoleonic wargamers; not the 'last word' on the subject by any stretch of the imagination, but a book that would provoke interest and enquiry in the period and help to stimulate, or foster, a life-long interest. I was sadly disappointed. The book lacked ‘flair’ or ‘enthusiasm’ in the writing, had a strange structure, a disappointingly large number of major typos and errors (as my four pages of handwritten notes and corrections attest!) and then there are the rules... Any connection between these rules and a Napoleonic battle are purely coincidental! 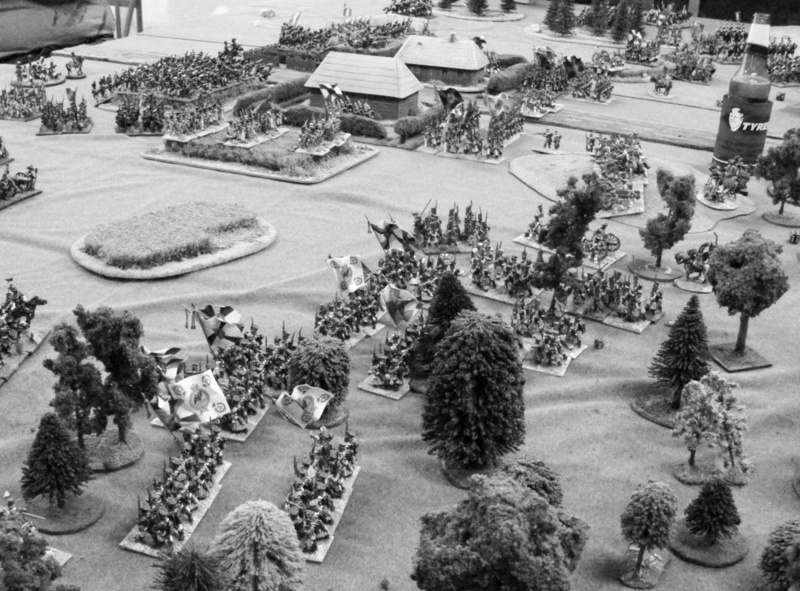 Grand Battery is beautifully presented with many wonderful colour and black and white photos of Napoleonic wargames figures of various scales. The picture on page 73 of Prussians running up against French cavalry and guns is even reminiscent of the picture on page 6 of Quarrie’s Napoleonic Wargaming! Yet, as with so much of this book, these photos do not stand closer inspection. Where are the captions? What do the figures represent? Which manufacturer do they come from? How do the photos relate to the text? Two examples of the excellent photos that adorn this book. 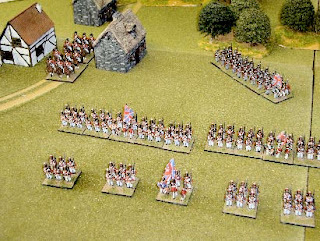 The top one of Prussians running up against French cavalry and guns, reminiscent of a similar photo in Quarrie's Napoleonic Wargaming and the bottom one of British infantry in line, skirmish and column formation. Sadly, no such captions are provided in the book. The large number of errors in this book are inexcusable. They diminished my enjoyment of it and made me question the veracity of all of the content. I would dearly have liked to have been a proof-reader as with a bit more attention to detail, a few additions and some corrections this could have been a classic wargamers’ guide. I will not bore you by listing all of the numerous errors that I found, but present a few of the worst cases to serve as an illustration of the type of errors and their wide distribution throughout the books 212 pages. Page 29 says that “The Peninsular War battles detailed as distinct wargame scenarios in both Chapter 8 of this book (where three have been selected)...”, but there is no Chapter 8. This refers to Chapter 4. On page 33, the description of the Battle of Arcola ends “in the New Year another attempt would be made”, but the result of that attempt, the Battle of Rivoli is not included in this period history. Several incidences of mis-spellings are present with most referring to well-known places or people. We have “the Danbube” on page 52, “Bessiere’s cavalry” on page 54, “Thomiere” on page 63 (several occasions), Latour Manbourg and Nansonty on page 67 and Davout spelt as Davoüt throughout. On page 65 outlining the Battle of Borodino, the forces involved include Britain, 120,000 commanded by Kutuzov. On page 70 the description of the Battle of Vittoria ends with “the French army disintegrated and the losses totalled, with 151 or 153 guns captured”. In chapter 2 figures from Waterloo are often quoted, but this was not a typical battle so it is not indicative of the general situation that prevailed for much of the period. Page 93, erroneously states that “the new war with Austria broke out in 1808”. On page 107 it is stated that “target practice was very important...” but then on page 108 “infantry were not trained to necessarily aim at their targets...” Such inconsistencies are a source of confusion to the novice and annoyance to experienced or knowledgeable reader. Most of these are simple typographical errors, but they point to a lack of final proof-reading and detract from the quality of the book. Grand Battery beings with a ‘no nonsense’ introduction. This is fine, but it does not create a sense of anticipation or excitement about what is to come in the book nor about the hobby that the reader is about to embark on (if new to wargaming). It is in this introduction that one finds the first of the many errors and omissions. The book claims to include information about combatants of nations from the Austrians to the Ottoman Turks and including the numerous minor nations, but the chapters on “The Armies” and “Weapons and Tactics” only cover the major nations although, to be fair, the chapter on “Organising Troops” does have army lists for numerous nations, both large and small. The introduction also mentions that the Pen & Sword website has “additional scenarios, rules clarifications, battle reports, downloadable cards, templates and ready reference sheets and a host of other game support”, but I could find none of it by either a search of the site or by clicking and browsing. Chapter 1 is a chronology and description of ‘major’ battles. This is largely a descriptive narrative of the wars which needs maps and an overview of each campaign to draw it together and make it easier to read. Not surprisingly, I questioned the choices of some of the ‘major’ battles. For example, Maida and Roliça are included but there is no mention of any of the famous six days’ battles of 1814 (Champaubert, Montmirial, Chateau-Thierry, Vauchamps and Montereau). I would also question the assessment of the outcome of several of the battles listed. As with the rest of the book, this opening chapter is written in a ‘workmanlike’ style, lacking flair, with many misconceptions and far too many errors. Chapters 2 & 3 describe the “Armies” and “Weapons and Tactics” respectively of the major nations. I’d like to compare what is in these chapters with what I think wargamers need. After a brief and general introductory paragraph the authors launch into a description of the armies of each of the major nations using terms regarding types of troops, weapons and equipment that would be familiar to experienced Napoleonic wargamers or ‘students’ of the period but would likely bemuse the novice. In my opinion the chapters should have been combined into one and opened with some general statements about Napoleonic armies. The authors could then have introduced the troop types and roles of each, showing how they relate to the rules. Having done this, the descriptions and specific details related to each of the armies could have followed logically and without the repetition and contradiction that besets the current text. These chapters do contain some useful snippets of information, such as the cavalry to infantry ratio in the Austrian army compared with the French and the numbers of Austrian heavy cavalry compared with other nations. No matter how much I read and despite 30+ years as a ‘student’ of the Napoleonic period, I can always learn more. Unfortunately though, these chapters suffer from the same problem as all of the others so that, for example, the ratio of cavalry to infantry in French army quoted in Chapter 2 (one to three) is contradicted in Chapter 3 (one to six). Chapter 4, “Organising Troops” provides examples of the organisation and relative qualities of troops from nearly all nations that fought in battles in various European campaigns between 1799–1815. This is a useful reference and overview, but it is not clear how one list relates to another, how they are derived from historical orders of battle and how they may be used for competitive games (although I suspect that the rules are not intended for this latter purpose). The rules themselves (Chapter 5) are an interesting mix of ideas from other sets. Mechanisms such as card-based turns for movement (Piquet), charges including resolve of defenders and then of attackers (common to many wargames rules of 1970s and 1980s, including Quarrie's), use of a number of combat dice (Piquet, Blackpowder), command impact on responsiveness (similar to many boardgames, Empire, Napoleon's Battles), and quality of command affecting initiative (Empire) are familiar. That said, these mechanisms and ideas have been combined into a genuinely novel set of rules. It is one thing to read a set of rules, but to evaluate them properly it is necessary to trial them by play-testing. We chose the Battle of the River Cóa (often called action at the River Cóa) for this purpose. This action has many elements that make it ideal for play-testing a new set of rules; the action is relatively small, it involves all troop types, terrain is a major factor and command and control are crucial to the outcome. A full report of this battle is provided on our blog (Battle of River Cóa report). In short we concluded that if you want a fast, furious game with lots of quick action and casualties that will play easily for a group of novice wargamers or wargamers unfamiliar with the rules, then these are for you. If you want a set of rules with a Napoleonic “feel”, an historical look and results that reflect history, then they are not. The last two chapters of the book were two of the most useful and interesting. Chapter 6 lists three scenarios to use with the rules, but in truth they could easily be utilised with any rule-set. Refreshingly, three little-known battles are chosen—Neerwinden 1793, Raab 1809 and Ligny 1815. This makes them a particularly useful resource for wargames scenarios. Sadly the errors that beset the rest of the book are also here, with the aim for Neerwinden stated as “to route the enemy forces”! The final chapter, “Buying guide” is a gem. It contains well presented, useful and objective information about figures from a wide range of manufacturers. The authors resist the temptation to push their favourite scale or style of sculpting. This chapter is of great use and interest for the novice and experienced gamer alike. It is particularly pleasing that manufacturers of 1/72nd plastics are included, since the hobby often has a snobbery around metal figures compared to plastics and we are devotees of the latter type. 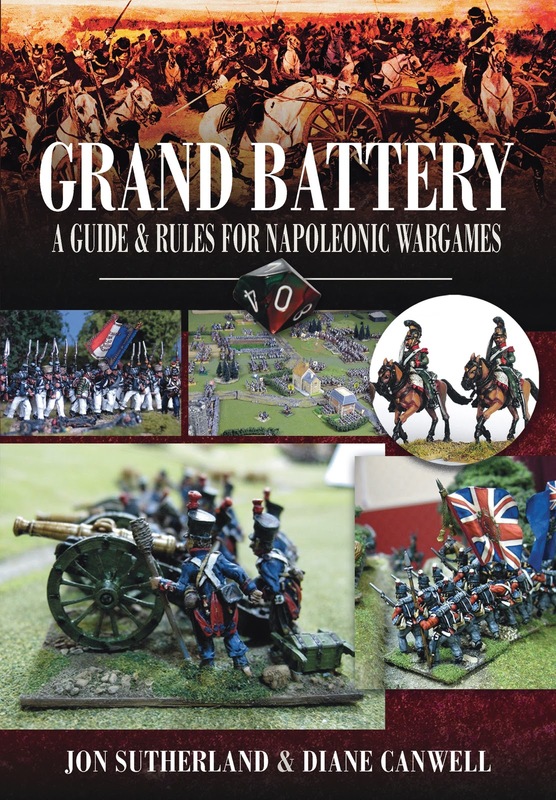 Thus, while the numerous errors and misconceptions are disappointing and frustrating and the rules do not offer much, Grand Battery is still a useful book. Yet it could have been so much better. Thank you James. I belong to your same generation of (once) enthusiastic boys, introduced to wargaming using Bruce Quarries' rule set. At first glance, Grand Battery trasmitted to me your same disappointment. I am not English mother speaking, but I did spot same of the linguistic and editorial inaccuracies you pointed out. It's such a shame Giuseppe as it would not have taken much to have improved the publication so that it could have enthused and inspired another generation as Quarrie's did for you and me and countless others! The Grand Battery rules are another matter though and are best avoided. 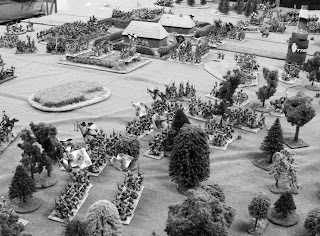 Quarrie's rules, which had their problems (especially the devastating artillery), at least represented something like a Napoleonic battle and could be edited (half effect of artillery) to make them playable with small numbers of figures. They have now been surpassed numerous times by more recent rulesets. Grand Battery is not one of these. For us, Grand Battery represent the base level against which everything else may be compared! Thanks for reading the review and for your comments. I particularly appreciate you writing in English.